Recent archaeological studies have found evidence proving that King Kavantissa had a daughter who was a sister to King Dutu Gemunu, Media Spokesman of the Ministry of Education Kalpa Gunaratne told yesterday. 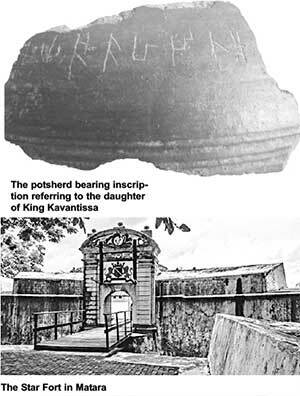 Gunaratne said that a stone inscription on a potsherd unearthed from Tissamaharama has a reference to a daughter of King Kavantissa. The potsherd had been a part of a begging bowl. It has a reference in Brahmi inscriptions which read Aya Thisha Ha Kandhitha A’. Gunaratne said: "Prof. Sirimal Ranwella, who inspected the potsherd says that the term Aya Thisha had been used to refer to King Kavantissa. The term had been noticed frequently in references to King Kavantissa in many inscriptions found in Ruhuna. The term Kandhitha is used in ancient inscriptions to refer to the term daughter, according to Prof Ranwella." Gunaratne said the potsherd had been unearthed during an excavation conducted at Sarvodayawatte Excavation Project in Tissamaharama conducted jointly by the Department of Archaeology and a German Institute. The antique is currently at the archaeological museum at the Star Fort in Matara. Gunaratne said: "Prof. Ranwella and other experts have pointed out that the reference in the potsherd could be the first archaeological evidence confirming the historical sources that King Kavantissa had daughters. Those princesses were sisters of King Dutta Gamani and there were references in the 18th Chapter of the Deepavamsa that they later became the members of Maha Sangha as bhikkhunis. According to archaeological experts the most recent find was a rare occurrence where archaeological evidence confirming a historical evidence. It is also important to note that Mahavamsa does not have any references to sister princesses of King Dutu Gemunu or the daughters of King Kavantissa."